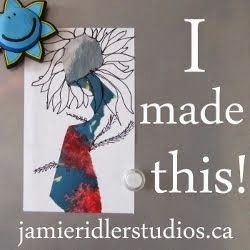 Jamie Riddler at Jamie Riddler Studios has invited us to share something we made this last week. A week ago it was so warm, and I went to a Spring open house at a local nursery and was so inspired by the displays. 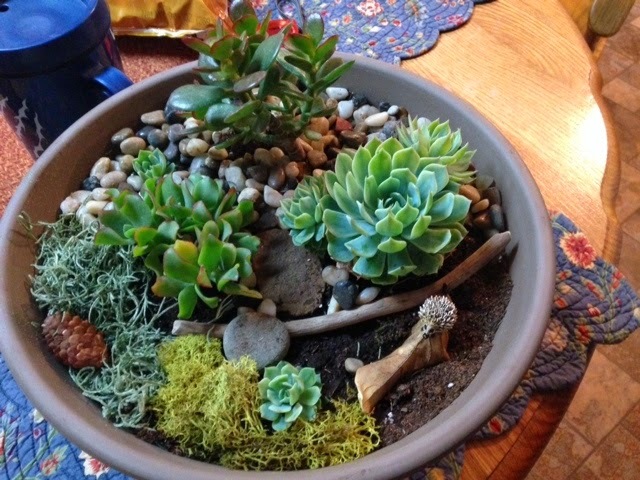 I decided to make my own succulent garden. It is now back near freezing, so I hope it is happy inside until warmer temps return. 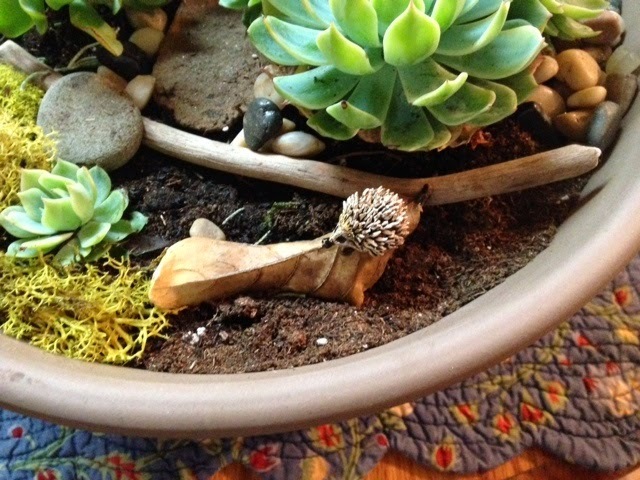 I couldn't resist making this a cozy home for the little hedgehog. Didn't have anything that really went along with this month's post. So I found a stamp I thought I could layer and had some fun. First time for Distress Markers. 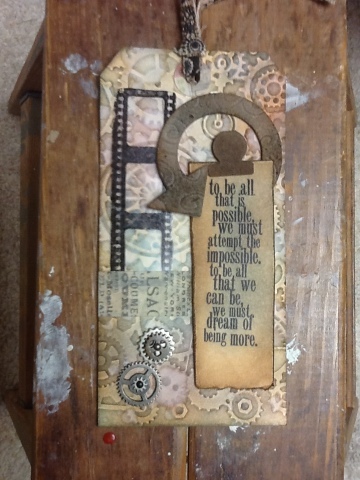 Here is my take on Tim Holtz's January 2013 tag. Had to make do with what I had on hand. No filmstrip but I did have acetate and a Tim Holtz filmstrip stamp! Worked out fine. Gotta get me the gear dies! 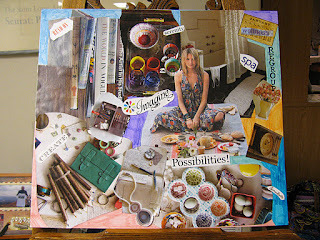 I am having the best time with the Canvas Create series with Donna Downey! Working on canvas is awesome. 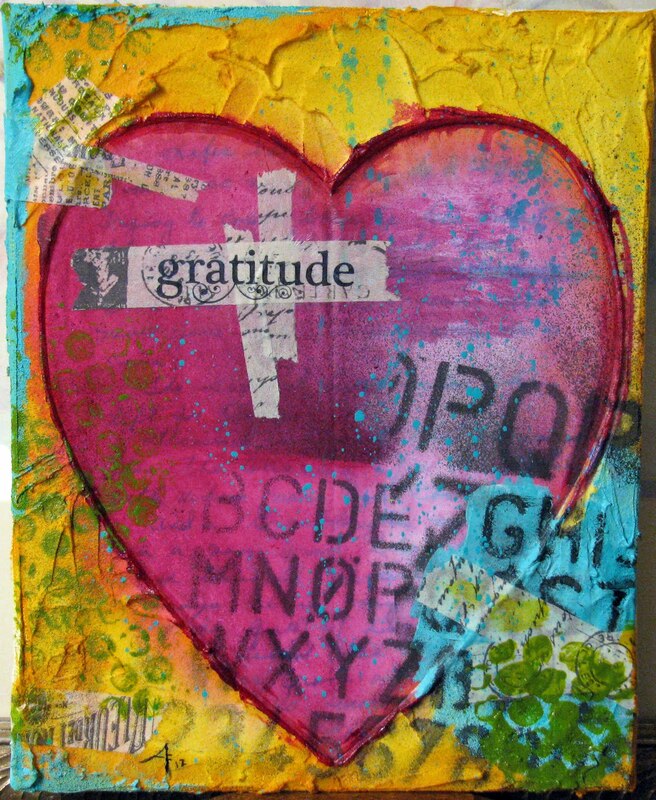 I had canvases and had created some mixed media pieces mainly like decoupage. Painting and mixed media is more rewarding for me. I think I feel like a "real" artist painting on canvas.LOL. I did two for January. Mainly, I did two because I was afraid to write on the first on so whipped up a smaller one to practice on. It turned out my flower was way better on the second one. I liked the way the word goes up the side on my "practice" canvas. But I like the background on the first attempt, better. I know I will use these techniques and create more similar to this. The February project used modeling paste. Never used this before, but you can do such neat stuff with it besides just make a textured background. I am really glad I committed to this series of lessons. It gives me a focus each month so that I have no excuses not to create. Over at Jamie Ridler's Studio, Jamie hosts full moon dreamboards every month. This month is the Full Worm Moon. It asks: What dreams are emerging...what is stirring? Every month it seems some sort of timepiece makes it way into my dreamboard. It isn't that I don't have time to do things, or take care of me, or accomplish what I want or need to do. It is more of making really good use of my time so it doesn't slip away and leave me feeling like I lost the opportunity of the time I have. 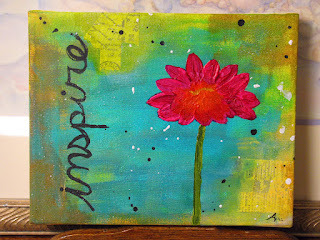 This month,my board is reflecting what is stirring from within me as spring approaches. 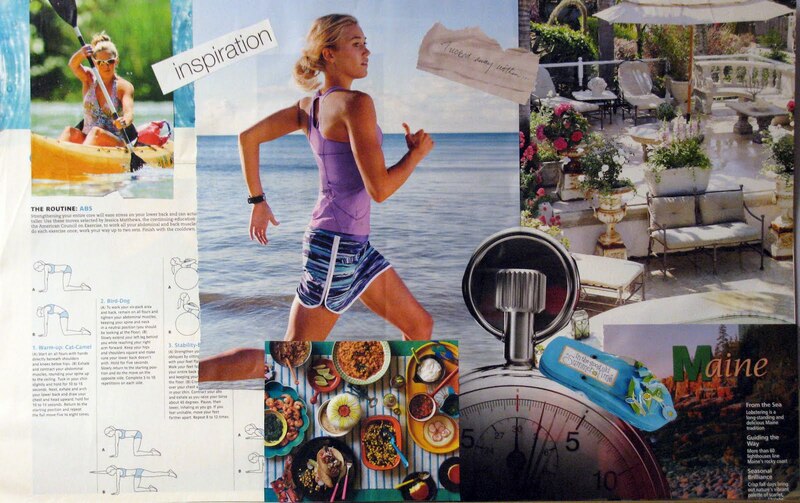 The desire to get into the best shape I can, the desire to eat delicious healthy foods, take the time to go kayaking and be in nature, and enjoy our yard and deck. What is stirring especially is the anxiousness to see Maine, again. Plans are emerging for a visit there this summer. Yippee! 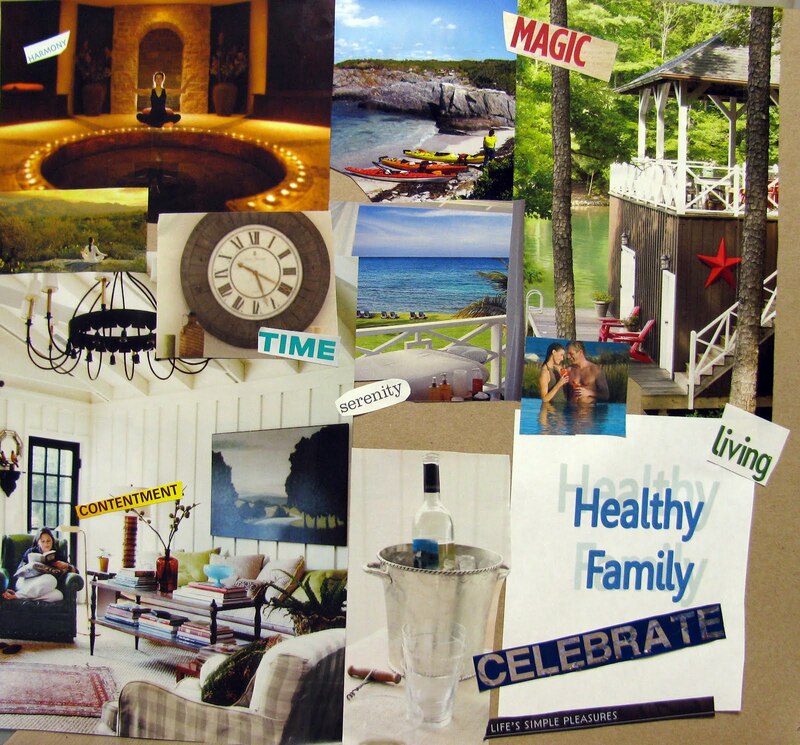 My ongoing desires are to bring more harmony into my life and the lives of those around me (mood swings of menopause has inspired this desire!). I also want to feel contentment and serenity in my surroundings and make our home a place we want to hang out in. My biggest selfish desire is to someday live on the shore of some kind of water…lake, river, OCEAN! It would be magic to me. For now, traveling to water is the plan for summer. Most of all, I desire to remember to celebrate living and life’s simple pleasures. There are some health issues with a close family member. I want to celebrate each good, living moment with them instead of thinking of what may eventually come. In order to gather these desires and turn them into a daily reality, I need to remember to take the time to be present, plan, and make space for these desires to happen. As I started pulling pictures for my January Full Moon Dream Board, it became apparent there were a few repeating themes. I had a fantastic December and holiday time. It was relaxing, and I felt I really had a chance to enjoy each day. However, January's start has been hectic with family illness, injuries to loved ones, more to do with my job and it seems it should be way past January 9. Everyone is doing ok, now. I am ready for a breath with no worries. So...my dreamboard is reflecting what I am envisioning (and hungry for) for the rest of the time. Time to regroup, find my balance that I had last month. 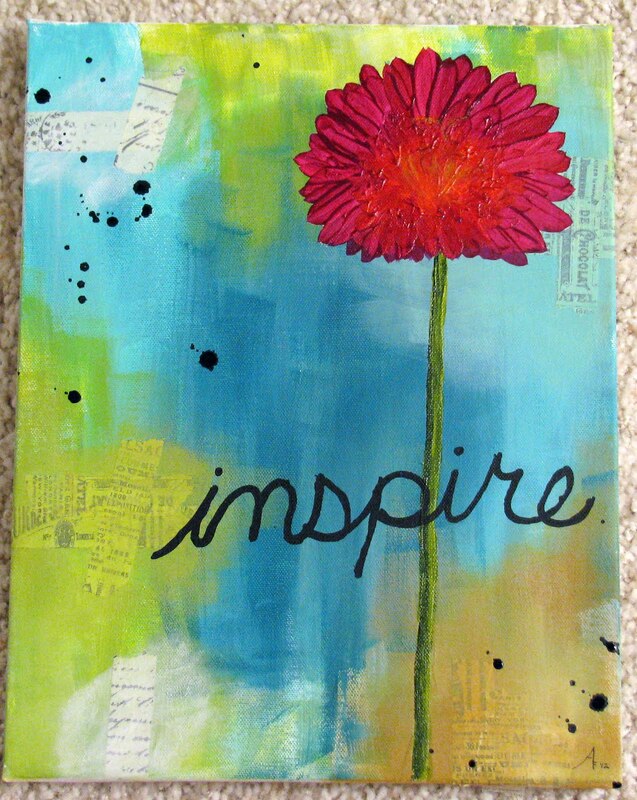 I intend to find time (the clock) for reading, creating, pampering, and trying new things in the kitchen! Thanks to Jamie for having this group!